"Tipperary Pines" is located in Fern Valley just a short drive (.8 miles) from the village. Park in the circular driveway and go up just a few steps onto the wrap around porch. In the back, the view is absolutely lovely. You can bar-b-q or just relax in the Adirondack chairs with your morning coffee or wind down after a day of shopping or hiking with a glass of wine. Back to the front door you enter into the mid level of this really darling cabin with rustic hard wood floors on entire level. To the left, is the first of 2 bathrooms. Knotty pine walls, rustic design with a shower. Back into the main room, is a huge living room with big cozy couches, wood fire place, wood burning stove, and a wall of windows so you can enjoy the beauty of the outdoors while snuggling in front of the fire place or playing games with the kids. This house also has tons of books and vintage toys to keep the little ones busy. Grownups will enjoy the toys as well. Some you may have had yourself as a child. Off the living room is a dining room with a darling antique table which seats 6. Just to the left is the kitchen with more knotty pine walls large refrigerator, microwave, coffee maker, tea kettle, toaster, blender, corn popper,and electric mixer. All the comforts of home. This kitchen isn't huge but has plenty of room to comfortably prepare a meal for the whole family. Up the staircase is the top level of this home are 2 bedrooms. Both rooms have knotty pine walls and beautiful vintage bedding. All the windows make these rooms very bright and cheery. Back down to the mid level, you descend the stairs to the Master suite. You will surely enjoy waking up on this very comfy Queen size bed and seeing the view out the windows. Maybe start a little fire in the built in wood burning stove to take the chill off and just crawl back in bed to snuggle for a while... This suite has a door that opens onto another private deck with Adirondack chairs. Beautiful view!! The full master bath is large and, like all our homes, has fresh fluffy towels. 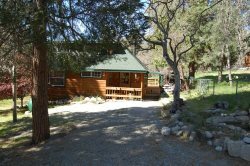 Both upper and lower decks are quiet and private and you will love watching all the little chipmunks, squirrels, and birds that love to frolic and jump around in the trees. Your little ones will definitely enjoy exploring, climbing trees, and frolicking around the yard themselves. This cabin has TV with cable, VCR, stereo, tape deck, CD player, and radio. There is also an iron and ironing board for your use. Sorry, NO pets and NO SMOKING. The Fern Valley area is right outside of town. It is located close to many of our hiking and biking trails. Please request trail information by contacting our office!